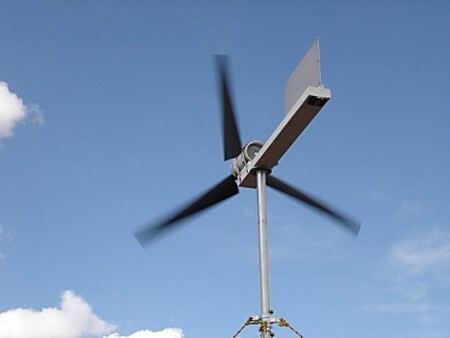 Wind turbine, also called windmill, is a device that easily converts wind energy into electrical energy. Due the variations in the air pressure, the blades of the windmill move. 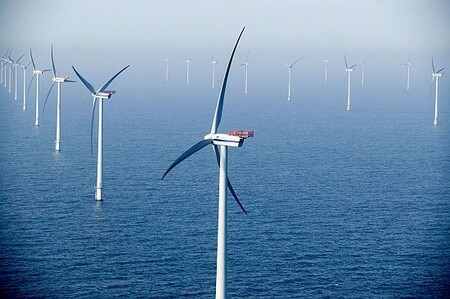 Owing to the movement of the blades, the wind energy is converted into mechanical energy, which is finally transformed into electrical energy and used for running various home and office appliances. The materials needed for building the wind turbine are plywood, ribbed cardboard, disk magnets, 3-mm dowel braces, ¼-inch circular dowels, 5-mm lead, 8-inch eye screws, 3-cm washers, and 28 gauge enamel magnet wire about 120-m in length. The tools required are screwdriver, scissors, compass, knife, measuring tape, white glue, electrical tape and voltmeter. On a plain paper, draw a circle that is 12-incles in diameter. Cut out the circle and fold it to form a semi-circle. Cut through the folded end of the circle to obtain two halves. Place the two semi-circles in such a manner that rounded portions are not on the same side. Moreover, the top half should completely cover the lower half. Glue the two parts together, and use them to draw the design of the blades on the cardboard. The capacity of the windmill to harness wind energy is directly proportional to the number of blades. Thus, more blades will trap in more energy. Take the plywood and on it draw a circle whose radius is 6-cm. Cut out the circle and drill a hole in its center. About 8-cm below the hole affix a 30-cm high vertical post. At the bottom of this post attach a foot support. Use an eye screw to attach a circular dowel to the horizontal frame. With the help of the cardboard and electrical tape, create a tube that is 20-cm long and 3-cm wide. Wrap roughly 200 coils around it, and be sure to leave 40-cm of coil at each end. Remove the twisted wire from the tube and secure it with electrical tape. From each end of the coil, remove 15-mm of enamel and test the current with the aid of a voltmeter. Make three more coils in this manner. Lay them side by side in such a way that all of them are in the same clockwise direction. Join the coils and glue them to the base of the wind turbine. On the cardboard, draw a circle of radius 6-cm. Cut out the circle and punch a hole in its center. Through the center of the circle, draw a cross. On each of the four ends of the cross, place a washer. The disk magnet should be placed upon the washer in such a manner that the north side of the magnet should be away from the washer. Take a plastic bottle and create a plastic tube out of it by cutting its top and bottom. The radius of one side of the tube will be 6-inches. On this side, the blades should be pasted. Ensure that the blades are evenly fanned out and sealed at one end. Mount the tube on the vertical support created earlier. At the opposite end of the tube, punch a hole for the circular dowel. To this dowel, attach the cardboard with disk magnets. Make sure that the magnets face the coils that are placed at the base of the wind turbine. With this the windmill is ready for use.